Renée Gagnon mounts language, which is sound and image, mounts image, which is language, mounts sound, which is image, into a complex montage. In compositing the fragmentary, the voicing of her texts becomes cinematic, the music of her visual bearings, a long and undulating collage. Gagnon’s texts are elastic, pulling and releasing; puncturing, punctuated and textural. Her performative repetition is melodic, denying sameness while moulding a scape, a sounding of mounting montage, maintained and sustained, mountaining and unmounted, texted fragmented rep. Some of her projects implicate popular icons, such as Steve McQueen and Mister T, verbing their actions, creating an active langage that investigates the making of their iconicity. Her Symphonie des carabines, composed and improvised in five parts from samples of westerns featuring Steve McQueen, is a complex melodic opus played by the galloping of hooves, neighing, gun fire, bar conversations. Here we are urged into the violent seductive “west”, into our fall for its imagined promise, our fascination with our own fierce draw. Renée Gagnon has written two books of poetry, des fois que je tombe (2005) and Steve McQueen (mon amoureux) (2007) both published by Le Quartanier. 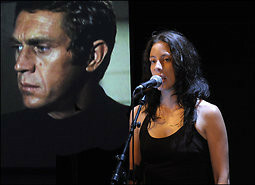 For the stage, she has created the works Projet McQueen (2008) and Somme : Soeurs (2009, with Mylène Lauzon). Her musical/textual collaboration with director Chloé Leriche, Qui est là, has been featured in several international festivals. She has also collaborated with Steve Savage and the 2011 spring issue of Telephone was dedicated to multiple translations (from French to English) of some collaborative work between Savage and Gagnon. She lives in Montreal.